Avian Adventures: Passion, Technology Feed The World Of Rare Bird Chasing : All Tech Considered For some, seeing birds is more than a pastime. It's an adventure. And although chasing rare birds is an activity so rooted in nature, technology is playing a key role. 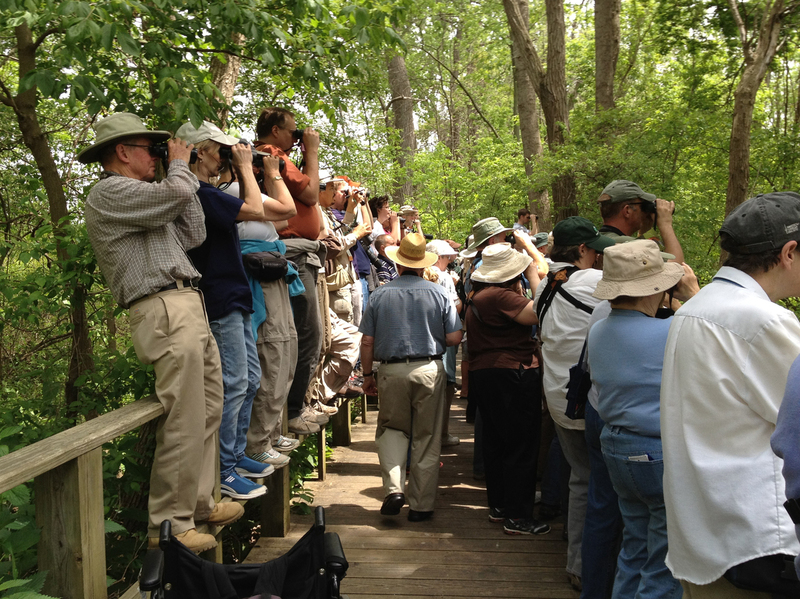 A group of birders watches a rare Kirtland's warbler at the Magee Marsh Wildlife Area in Ohio in May 2010. Nicholas Lund stood in a small side yard one early morning, surrounded by a crowd of people. Some were in business suits, just stopping by before work. He watched as others commuted by, probably unsure of what they were seeing: a silent mob of people holding large cameras, just waiting. Standing in a small space next to someone's home, those people were putting off life for a morning. But it was a bird's own displacement that had called them all together. This is happening across the world: People like Lund feel a rush of adrenaline after getting alerts via emails and websites with the names of birds that are not where they're supposed to be. And then it's time to act. These enthusiasts get in their cars, sometimes driving several hours to reach a random destination. After arriving, they adjust their binoculars, straining to catch a glimpse of a feathery creature they've never seen before. This scene, right out of Pokémon Go, is a product of two things: rapidly distributed information and a quiet enjoyment of nature. In the U.K., where this activity is practically a pastime, it's known as twitching. In the U.S., it's called chasing. But regardless of the name, those who partake in it seem to agree: When you get the birding bug, it's difficult to shake it off. "When people aren't out birding, they're just thinking about birding," says Lund, who works at the National Parks Conservation Association and writes about birding in his spare time. In early February, he wrote a column for Audubon with advice for successfully twitching. He says the fun of twitching is in its unpredictability. After all, even if someone sends in their sighting, birds have these funny little things called wings that give them freedom from staying put. "When birders have a chance to see a bird that they would otherwise have to travel to a different country or across the country to see — when they have a chance to see one nearby — it's extremely exciting," Lund says. "You have no warning of when they're going to show up; you have no idea how long they're going to stick around at a certain place. So if you want to see this thing, you've got to get there. You've got to go." Birders at the Magee Marsh Wildlife Area crowd around to look for a bird. 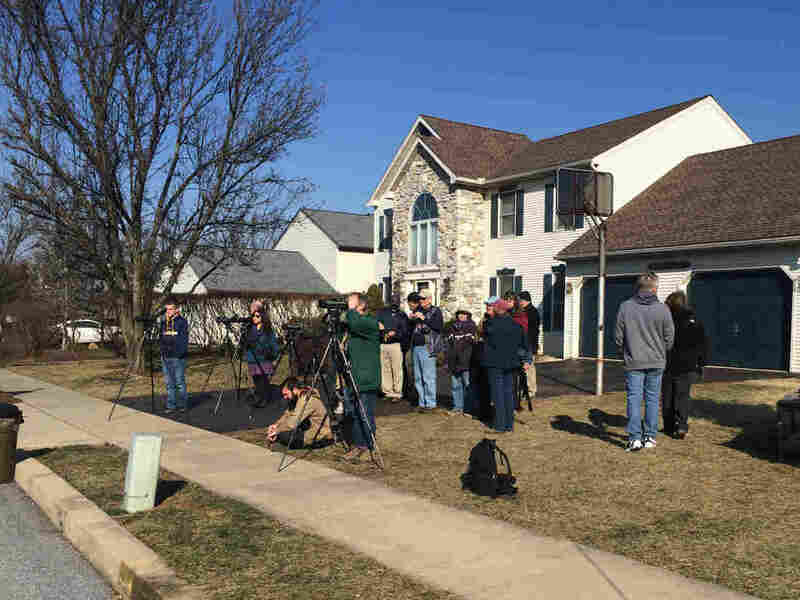 A group of birders wait for a black-backed oriole in a neighborhood in Berks County, Pa., in February. It's this rolling of the dice that's intriguing — no, obsessive — to Alan Davies, an avid birder from Wales. "That's what bird-watchers or twitchers say. They need to see a bird. They don't want to see it; they need to see that bird." Davies says he and his partner Ruth Miller got to a stage in their work careers at the Royal Society for the Protection of Birds where they decided they weren't seeing enough birds. "We were talking about birds, going to meetings about birds, spending lots of times looking at spreadsheets with birds' names on them, but we weren't actually using our binoculars very often on a day-to-day basis," he says. So they quit their jobs, sold their house and decided that 2008 would be the year of "the biggest twitch," an attempt to set the record for seeing the most birds in one calendar year. And a year later, having traveled to 27 countries, they broke the record by logging about 4,300 birds. Now he travels the world showing people the birds of foreign countries. In the last few months, he says, he's gone to Uganda, Costa Rica and Thailand. Laura Keene too has done her fair share of traveling in pursuit of birds. From the bright blue feathers of the indigo bunting that caught her eye on a high school canoe trip to the birds she now captures in photographs, she's spent years admiring their beauty. 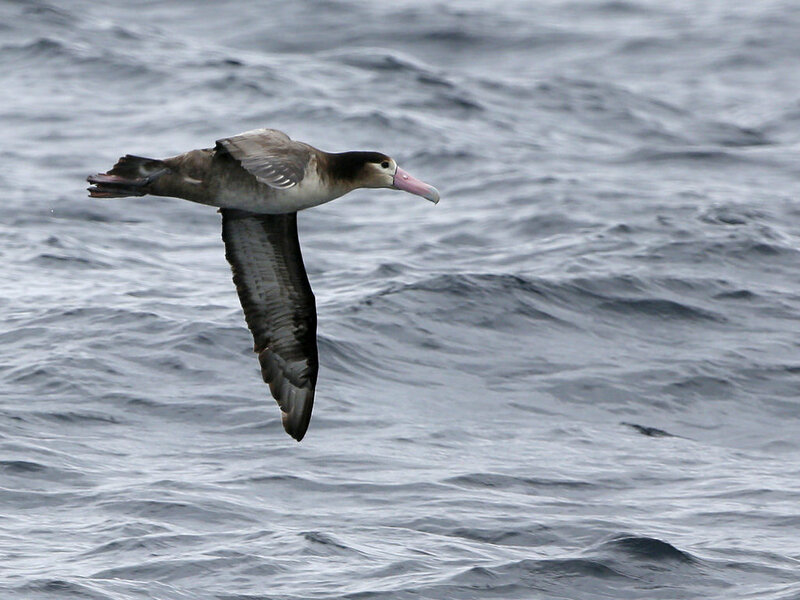 A short-tailed albatross flies between Alaskan islands in May 2016. "When you see something every day, sometimes you get a little jaded to it," she says. "You don't even really see the beauty that's there. But you see something outside of the norm, and you can see how beautiful it is." So in 2016, she made it her mission to see a lot of new birds. That year, she did what is called a big year, where she traveled across the U.S. to record the most birds in one year. Keene — who, along with three other people, broke the record — said she had an adventurous year in the process. "When you're 57 years old, it's exciting to have a big adventure and go somewhere outside of your comfort zone," she says. Because birders keep lists of the species they've seen, there's a competitive aspect to twitching. As one could imagine, those who embark on spur-of-the-moment trips tend to add more. And yet the birding community is a collaborative one. 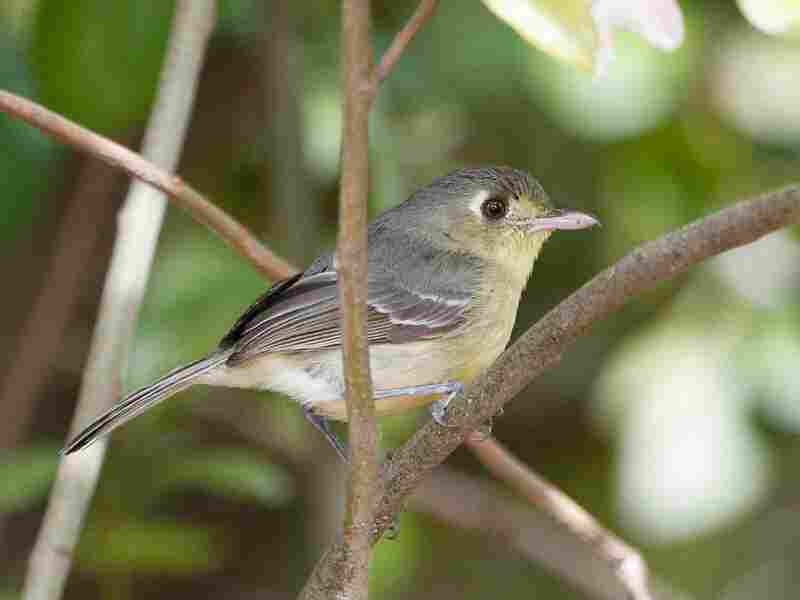 A Cuban vireo in Key West, Fla., in April 2016. "There is openness completely in the birding community," Lund says. "The main goal is to share the passion and share the individual bird with as many people as possible. And so those records are set based on dedication and exploration to sort of get species that others haven't found." And technology has helped this spread of information. Davies says that when he first began bird-watching, a sighting would be passed down through the grapevine. "I would maybe make 20, 30 phone calls and those 20, 30 people would then ring 20, 30 people and within a few hours, the news would be spread nationwide that this major rarity had been found," he says. But now, the information is instantaneous, coming through alerts on a smartphone. "If a rare bird landed on the beach, within five minutes of reporting that bird, everyone in the U.K. that needs to know would know," he says. "It's crazy." To begin a chase, birders must be informed on the whereabouts of a rare bird. And they get this information through a variety of sources: email listservs, websites and Facebook. Listservs are usually broken down by state. Birders will contribute if they see a bird or have an update on the status of a previous sighting. On the American Birding Association website, birders can subscribe to lists of birding news for different areas. And on eBird, users can upload their sightings and keep track of what they've seen. The website can provide rare-bird alerts or alerts for the birds a particular user still hasn't seen based on the data they've provided. These are just a few of the sources used, but some birders, like Doug Hitchcox, say Facebook has been making big waves. Because the site is less filtered, birders can find rarities they might not otherwise be aware of. People can post what they see in their backyard feeder in the many groups, like this one, and ask for the name of the bird. "It's a funny aspect that we have more people reporting these backyard birds that turn out to be immense rarities," says Hitchcox, who works as a staff naturalist at Maine Audubon. "There's so many more eyes out there." Keene says one of the reasons she was able to see so many birds during her big year was because of online alerts. It's not the effort that has changed, she says. It's just the technology. "Doing a big year in 2016 or '17 is a lot different than 2013, which is a lot different than 2008," Keene says. "So you know, comparing big years is like apples and oranges." 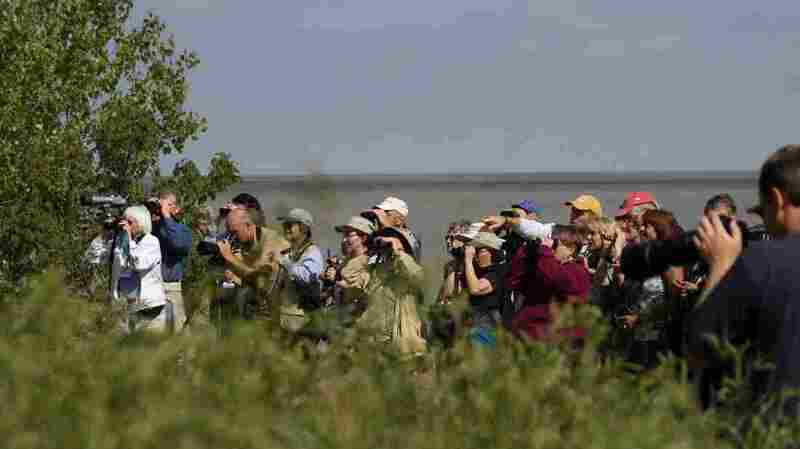 And some birders, like Justin Bosler, who works for an environmental consulting company in Texas, see more people participating as technology continues to advance. "People could tap right into [an] eBird bird sighting right in their vehicle," he says. Warren Strobel, a birder who works as a journalist at Reuters, says he's seen a lot of younger birders in the field. He says it might be their comfort in using technology that helps them get involved. "It's just made hearing about a rare bird or birds so much easier that that probably has attracted more people," he says. "And hopefully they'll stay with it." As Strobel says, "The birds are out there." It's just the humans that are needed to discover them. Cecilia Mazanec is an NPR digital news intern.